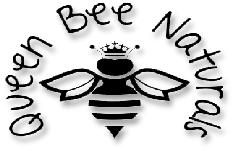 Welcome to Queen Bee Naturals on-line shop! This little wash duo is beautifully presented in a reusable hessian gift bag with bamboo handles and can be tailored to suit the individual. 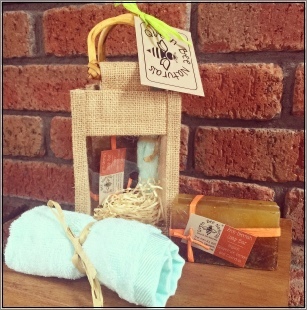 Gift bag contains a Super Soft Bamboo & Cotton wash cloth and an Organic Soap Bar of your choice! 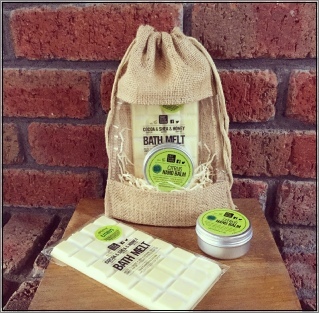 This is the perfect gift for anyone who loves their soaps - especially since this wonderful Soapology range is 100% natural, handmade, cruelty free, palm oil free and kind to your skin! 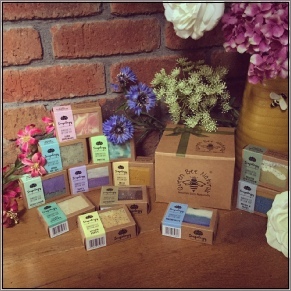 Select 4 of these wonderful soaps and they will arrive in a beautifully presented gift box. Superfoods Repair Cream for daily moisturising - packed full of skin healing and repairing herbal ingredients. This gift set contains everything you need for a full Bia Beauty facial! Mellow Mandarin Moisturiser 60ml, Orange & Grapefruit Facial Exfoliant and Cleanser 60ml and Stop the Clock Eye Gel 15ml. All products are suitable for all skin types. So go on....feed your face!! 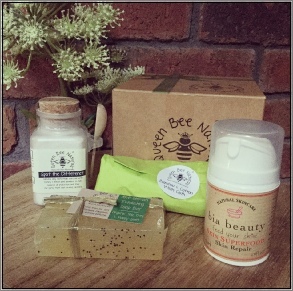 This wonderful all-natural skincare gift box is perfect for a new arrival. Contains the highly recommended All-over Baby Balm which can be used from head to toe from dry skin to eczema and from dribble rash to nappy rash! The delicately scented Counting Sheep can be used in babies bath or directly massaged into their skin to soothe and calm before bedtime. The looks-good-enough-to-eat Bath Melt is the perfect addition to their bath time with the anti-bacterial properties of honey and deeply moisturising properties of cocoa butter, Shea butter & coconut oil to leave their skin clean, soft and nourished. Super soft bamboo and cotton wash cloth. The cute, re-useable hessian drawstring bag makes the ideal gift for new babies. 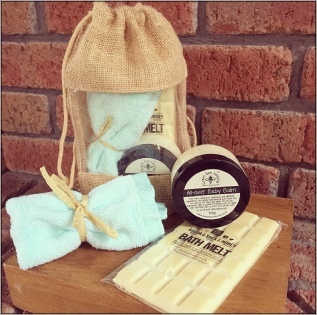 It contains a natural Bath Melt to hydrate baby's skin while in the bath, a Super Soft Bamboo & Cotton wash cloth to clean their delicate skin & a natural All-over Baby Balm to moisturise and nourish baby's skin from head to toe! 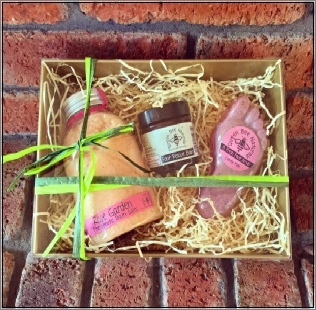 This gift set combo contains a Weird Balm Healing Salve to help heal, protect and soothe cuts, scraps, bites & stings....perfect for hard working hands!! And a funky B Fresh Foot Scrub to remove hard skin and soften the feet! We are so proud of this little set of goodness. 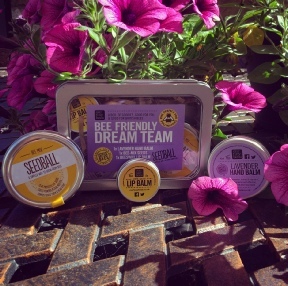 Our Lavender hand balm and lip balm are teamed up with the amazing Seedball - A simply way to grow flowers - A mix of five native wildflowers recommended by the Bumblebee Conservation Trust! A great way to pamper yourself and help our British bees and other pollinators by easily providing a source of food (and they look super pretty too). 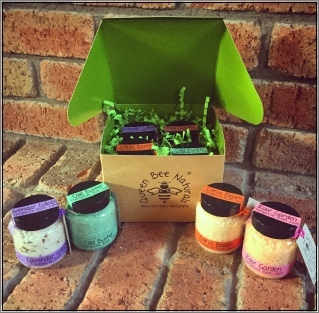 Build your own unique Queen Bee Naturals Gift Box! Are you looking for that perfect gift with a personal touch? Would you like to pick some products and present them in a beautiful gift box? Then QBN have made it easy for you! Simply select your chosen products then add this Gift Box to your basket and they will all be delivered together - couldn't be easier!! 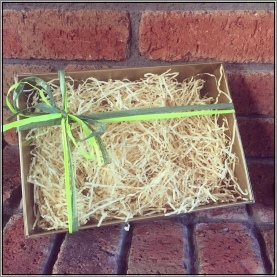 You can order your box with or without ribbons. *All products fit into gift boxes with the exception of Pixy Shower Mousse. 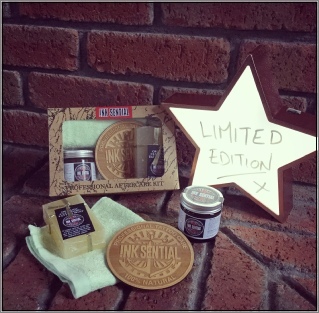 an organic tattoo cleansing soap, Bamboo was cloth and a limited edition wooden carved coaster! 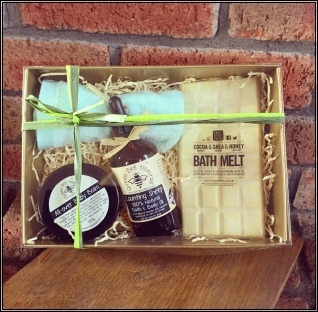 The perfect gift for those who love a nice relaxing bath and prefer to avoid all the artificial ingredients! 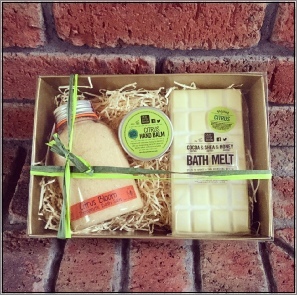 This gift box contains 4x 100g pots of Therapeutic Bath Salts so they can choose a different scent each time. Our Helping Hands Gift Set contains both our Lemon Myrtle Hand Wash 250ml and our Lemon Myrtle Hand Lotion 250ml – everything you need to keep your hands squeaky clean and super soft! They both come in cute pump bottles and will look great by your sink! The set also makes a fantastic gift for someone whose hands work hard – a new mum, gardener, nurse. As both products are 100% natural and contain absolutely no nasties. They are gentle on the skin as well as smelling amazing! A delightfully fresh citrus gift box containing our therapeutic Citrus Bloom Bath Salts to soothe aches & pains, soften skin and detoxify the body. A deeply hydrating Citrus Bath Melt to help lock moisture into the skin while bathing and a invigorating Citrus Hand Balm made with British Beeswax to heal, soothe, soften & protect the hands. We all love a bit of sampling and this cute little box has the answer!!! 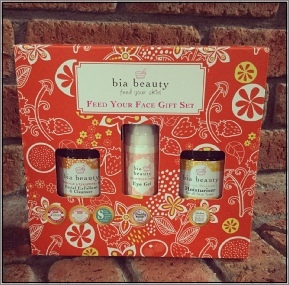 Containing 4 of our favourite Bia products....all in bite size portions so you can sample them before investing in the full size bottles! 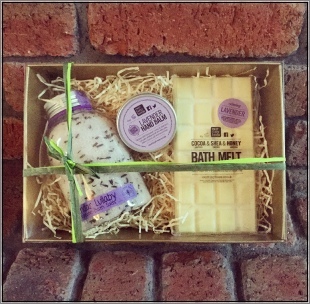 This wonderful skin soothing and hydrating gift set is a firm favourite with those who love the aroma of Lavender! Gift box contains: a deeply hydrating Lavender Bath Melt - just snap off a couple of cubes and add to warm bath water to replenish the skin from lost moisture, a natural Lavender Hand Balm made using British Beeswax to relief dry, cracked hands and leave them soft and hydrated and a tub of our amazing Lavender Lullaby Therapeutic Bath Salts to soothe aches and pains, remove dead skin cells and help the body re-absorb lost minerals to leave you feeling revived and relaxed. 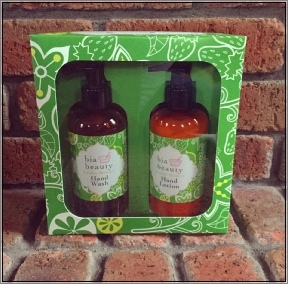 Feed your hair with this head pampering gift set! Included is our Super Hydrate Hair Food - a completely natural hair masque to deeply hydrate and nourish weak, dry and damaged hair while stimulating new healthy hair growth. 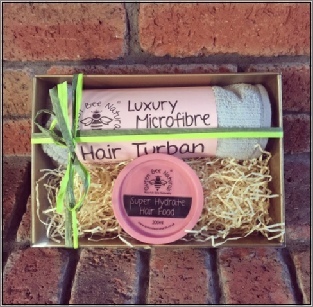 The set also includes one of our Luxury Microfibre Hair Turbans to enable you to apply the masque and wrap your hair up while it works it magic! Foot Rescue Balm! Sounds like Heaven!!! 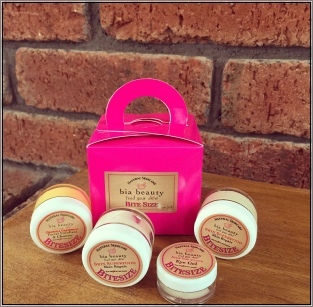 and a hand soothing Hand Balm.....both enriched with lemon, lime, bergamot & sweet orange essential oils! A gorgeous gift set for a new baby. Konjac Body Sponge to gently cleanse delicate skin, the Award winning All-over Baby Balm to hydrate and soothe dry skin, cradle cap, nappy rash, etc. A bottle of ‘Counting Sheep’ Bath & Body oil which can be added to baby’s bath or massaged directly onto baby’s skin and one of our natural beechwood teething rings to soothe sore gums. 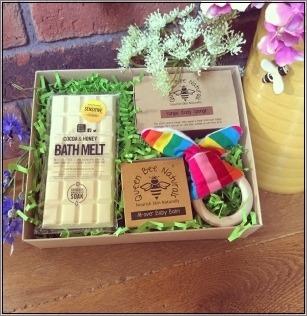 This gift box contains everything you need for a new baby’s skincare routine.....a Bath Melt to hydrate the skin while bathing, a natural Konjac Sponge and B Gentle hair & body wash to wash baby from head to toe - this is free from all harsh synthetic ingredients such as sulphates, colourants, perfumes, etc which commonly irritate delicate or sensitive skin. Then you have our award winning All-over Baby Balm to hydrate and soothe skin irritations such as eczema, nappy, rash, cradle cap, baby acne, dribble rash, etc. Pure skincare goodness in a box! 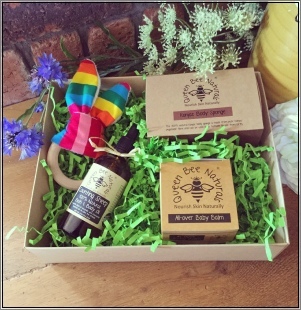 A unique baby gift box which includes our award winning All-over Baby Balm to hydrate and soothe common skin irritations such as eczema, nappy rash, cradle cap, dribble rash, etc. the Bath Melt to deeply hydrate the skin while bathing and a natural Konjac Body Sponge to gentle cleanse the skin while keeping it healthy. 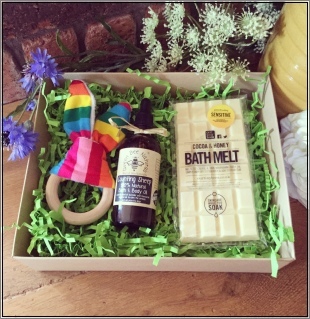 The gift box also contains one of our natural beechwood teething rings to soothe sore gums. A natural beechwood teething ring to help sore gums, the Bath Melt adds super, natural hydration to their bedtime bath and the Counting Sheep massage oil with lavender and chamomile helps calm baby and aid peaceful sleep. 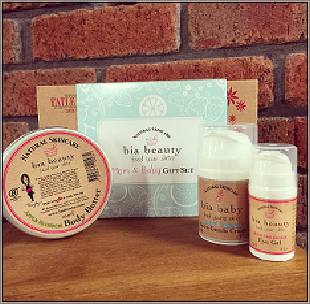 This deluxe gift set is full of our finest natural skincare products and is suitable for all skin types. It contains the Orange & Grapefruit Cleanser & Exfoliant which is gentle enough to use everyday and will leave skin feeling fresh and clean, the Spot the Difference clay face mask which deeply cleans the pores and balances the skin and you also get the Bamboo & Cotton wash cloth to remove the face mask. Then you have the Eco-Pure eye Makeup Remover which not only removes all eye makeup including eyeliner and waterproof mascara but it also enriches the delicate eye area with pure Vitamin E and anti-aging properties. Then to finish you have the organic No More Dramas face & neck oil which deeply hydrates by feeding the skin eep down in the layers where your cells rejuvenate - producing healthy, glowing skin while also tackling issues such as scarring, fine lines & wrinkles, uneven skin tone & free radicals. The perfect gift for your skin! 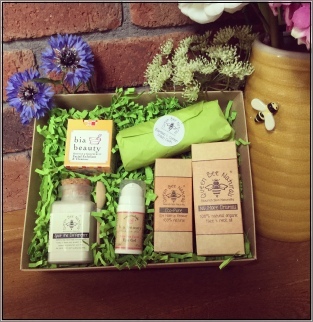 This 100% compostable gift box contains 4 natural skincare products just for MAN!!! 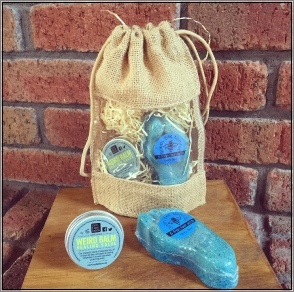 A natural Konjac Body Sponge to use along with the Perfect Gentleman natural soap bar, the aftershave / moisturising balm Man Salve and a Cedarwood & Tea Tree natural deodorant stick.